Copenhagen has often been recognized as one of the world’s most bike-friendly cities, making it the perfect city to see on two wheels. 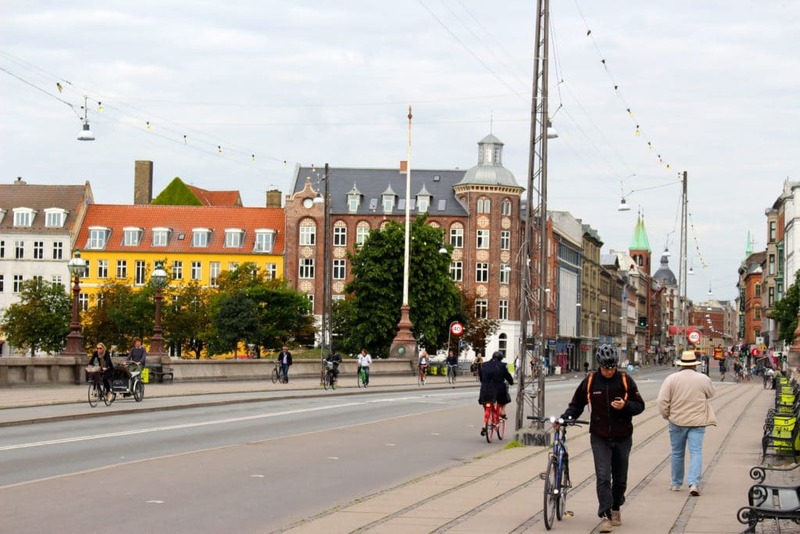 When I first arrived in Copenhagen, the city’s bike culture made itself known immediately; after noticing thousands of bikes parked on every sidewalk, and hoards of people zooming by, I couldn’t wait to discover Copenhagen in a new way. With just two days to explore Copenhagen, time was of the essence. Rather than wasting time on foot, we headed straight for a bike rental shop! Our first day started off by moseying around Kongens Nytorv (King’s New Square), but soon, we wanted to speed up our acquaintance with the city; after all, we only had 48 hours. After about an hour of searching, we discovered the best part of the city to rent a bike: Norreport. Norreport lies just north of the popular Kongens Nytorv (about fifteen minute walk) and serves as the city’s bike rental center. We discovered a rental shop that happened to be open at 9:30 a.m., and as soon as we handed over some cash, we were off biking Copenhagen! We didn’t have to bike very far to get used to the bike culture of the city. There are bike traffic lights, clearly marked bike lanes (often in blue), and non-biking areas. Biking Copenhagen became very simple after a while, to the point where it didn’t even feel like exercise anymore; it was just another mode of transportation. Compared to other places we’ve been, I definitely have to say that biking Copenhagen was straight-forward, fun, and the best way to see the city. Once we had completed our warm-up, we decided that it might be a good idea to find somewhere to eat, considering that we woke up so early that we forgot about breakfast completely. Before the trip, I made a list of some the places I’d like to visit, to maximize my time biking Copenhagen. First on the list was Torvehallerne. Obviously, food is a huge deal to Maddy and me, so it was only fitting to go to a food hall that houses some of the best food in Copenhagen. We parked our bikes without locking them and went inside. And yes, I’ll repeat that. Without locking them! People in Copenhagen actually understand that it is not okay to steal, making it customary to not lock up bikes there. I was shocked by that fact, but when I walked into the hall, I was even more surprised by how delicious the aroma of the Coffee Collective smelled. Recently I’ve ventured into unknown territory. Since realizing that my natural energy wasn’t enough to carry me through my long days, I’ve started to drink coffee. And in this short time, I’ve had some pretty delicious brews. But Copenhagen showed me what great coffee actually tastes like. My favorite, by far, had to be the Karagoto roast from Kenya; the coffee’s fruity accents really allowed me taste the flavors of the lush Kenyan jungle. I felt the caffeine almost instantly and I was wired. I was awake, but not ready to go yet. First, I needed something to eat! I wasn’t really sure what to get, but I do like to have local food everywhere I go, so I knew it’d be something local. Since Copenhagen is a city on the water, I chose to get some seafood at HAV2GO, which is part of the restaurant known as HAV. The most typical meal that I saw on their menu was a smorrebord (also known as an open-faced sandwich), so I chose to get mine with salmon, dill, and spread. Simple, but efficient, I ate very quickly and we were back on our way. We hopped back on our unstolen bikes and were ready to take on the city in the time we had left! We cruised around the area of the Norreport Station, as well as the City Center, and got to see what the area was like: filled with bicycle shops, all sorts of shopping, and various restaurants. Biking Copenhagen allowed us to discover that the city is the perfect blend of modern and antique. Everywhere you look, you can spot an 18th century, Baroque style building, and within the same view, a building that boasts current Danish minimalist, simplistic style. A city’s architecture is something that, almost automatically, leaves a lasting impression on tourists, and from the get-go, I knew Copenhagen was a place I’d want to return to over and over again. Next, we decided that we should bike over to the neighborhood known as Norrebro, where we found a subtle – and then very obvious – change in scenery. And when I say scenery, I don’t mean the the style of buildings, or streets that look different; I mean a blend of cultures represented through restaurants and style. Almost immediately after we crossed the bridge, we could tell that the area didn’t just represent traditional Danish-Nordic culture. If I had not just eaten a few hours earlier, I think I would have stuffed my face with all the delicious food around (especially the Middle Eastern food that seemed to lie on every other street corner). Jægersborggade is known as the “best street” in the whole neighborhood because it has a little bit of everything. 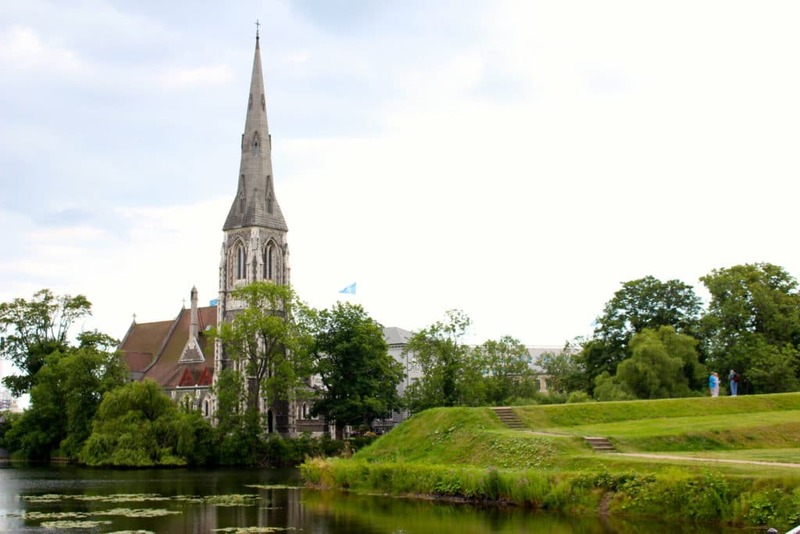 This area represents the more unfiltered part of Copenhagen because it brings out the best of all that the city has to offer, whether that’s world class food, modern Danish design stores, or exquisite night life. One of the best spots in the entire neighborhood (according to locals and foreigners alike) is the Mikkeler and Friends bar, a microbrewery that boasts over 40 different types of beer on tap at any given time. This is everything I wanted to experience in Copenhagen in one place, but unfortunately, I didn’t have time to go. If you visit Copenhagen between now and December, please let me know how it is. We’ll be headed back to check it out the day after Christmas! Not too far of a ride from Norrebro lies the fashionable, “posh” neighborhood of Frederiksberg, which ended up as our next destination. This area is more spread out than other neighborhoods, allowing us to do a lot of riding without the congestion of cars and other bicycles. The first sight we sought out was the famous Frederiksberg Palace in all its majesty. It is the most monumental Baroque work that Copenhagen has to offer, and although most of its influence comes from Southern Europe, its design has a unique touch that makes it stand out from traditional Baroque works. In front of the Palace were the Frederiksberg Gardens, so we decided to do some free riding and enjoy the gorgeous day – it was about 75 degrees Fahrenheit (24 degrees Celsius). The area of the Palace and the Gardens made me almost forget which century it was; I felt like I was thrust back a couple of centuries, into Denmark before there was much global influence. Being in a setting that takes me to a different time (in my head), a setting that lets me feel the history and significance of where I’m standing, is one of the greatest joys of travel. Anytime I experience this feeling, it’s an immediate confirmation of a great adventure. After four hours of biking Copenhagen, it was safe to say that our stomachs wouldn’t allows us to continue unless we ate properly. Just south of us was the neighborhood of Vesterbro, and this would be just the place for some sustenance. Vesterbro contains an area known as the Meatpacking District, which is also known as the home to some of the city’s best restaurants. The spots that were recommended to me most were WarPigs for some absolutely delicious beer and then BioMio to fill up on some good food. First, we had to go get some food; otherwise, I think that my Scandinavian trip would have ended right then and there with starvation. When I first walked into BioMio, I noticed a few things: the open kitchen, the health-conscious cuisine, and of course, the undeniably delicious aroma that it exuded. I had the most filling option on the lunch menu: the roast beef sandwich. And before you start judging me for picking a “normal” dish, let me tell you that this was unlike any other roast beef sandwich I’ve had. The ingredients were all local Danish products, evidenced by the savory meat and crunchy bread that melted in my mouth. Our hunger forced us to inhale our food, and next, we made our way over to WarPigs for some early afternoon fun. Upon entering, I discovered that WarPigs was credible from Day One, because of the people behind its creation; Danish brewery, Mikkeller, and American brewery, 3 Floyds, came together to make perfection. This place serves 22 different tap beers – featuring both temporary, experimental flavors and classics – made right there in the in-house brewery. I had four beers in total: the Black Fang, It’s Alive!, Notorious, and finally, the Illuminaughty. Each had its own distinctive flavor, but all of them also accentuated a certain flavor that made it known as a WarPigs product. By this time, I thought that I was going to be able to continue riding around the city, but unfortunately, my legs and my not-so-sober state betrayed me. Somehow, we made it back to the bike rental shop and then hopped on the metro to reach our hotel. The day wasn’t over yet, but I sure needed a break before round two! First of all, I love how almost every post you guys write talks about food. You’re definitely my kind of people ;) Second, Copenhagen sounds amazing! I’ve always wanted to do a bike tour (whether done independently or lead by a tour guide) but have never had the chance to do it. Great post! Thanks a lot for commenting! Yes Maddy and I are most definitely obsessed with food, it’s a huge part of the travel experience for us and the biking helped to burn some of those calories haha. Hello, thanks for commenting! Agreed, the architecture there is gorgeous and something everyone should see. Copenhagen has been on my list for some time now and this post made me want to go there even more! 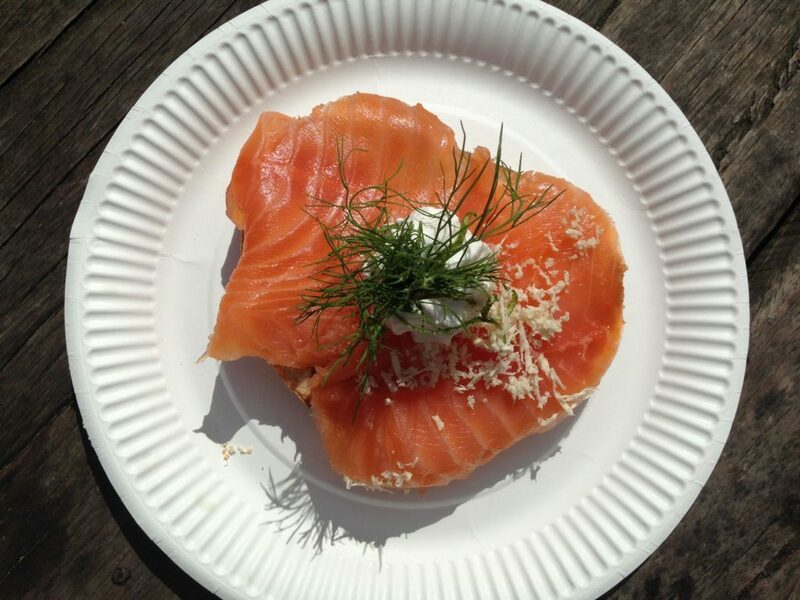 That smoked salmon open-faced sandwich with dill looks so yum too. Thanks for sharing this!! Hi, thanks for stopping by. You should make a point of visiting Copenhagen soon. Open-faced sandwiches were one of my favorite things about that city. Where is the pic of the roast beef sandwich? Hi guys! I stumbled across this post when looking for some tips on Copenhagen, since I wanted to start my own travel blog :) it’s been very useful, thanks a lot! All the best and enjoy your next trip! DEFINITELY start you own travel blog; and if you have any questions, we’d be happy to help you. Oops. Thanks for that tip! We’ll make the change straight away. I’ve heard of Copenhagen’s biking culture, but not about its coffee! One more reason to visit someday :) love this post! Hey Katie! Thanks for stopping by. The coffee and biking in Copenhagen are two awesome reasons to visit. We’ll be back in December to delve a bit deeper into the culture, so stay tuned! Copenhagen is one of my favourite cities, such a lovely place! It really is! We can’t wait to return in December! you are the best brother.And you’re awesome!